A college student journalism project spearheaded by the Pacific Media Workers Guild is being heralded by media professionals and industry leaders as a critical program to help the next generation of workers gain experience and introduce them to the value of unionism. Bay News Rising, a summer program of Pacific Media Workers Guild and the online news publication Fog City Journal, includes ten reporters and six photojournalists. During the program, which runs through July 31, the students are paired with industry professionals who serve as mentors and are tasked with developing and executing stories focused on social and economic justice issues, including labor and women’s issues. The program is funded by a grant from the Berger-Marks Foundation, and is thought to be among the largest grants the foundation has given and the first endeavor of its kind in the country. The students are paid for the work they develop, which appears on Fog City Journal’s website. Their work is also shopped to other media outlets for publication. Lunzer said the Berger-Marks Foundation, an organization committed to helping women organize into unions, and its funding also was critical to the project. “Assuming its success, we’ll be looking for ways to duplicate the effort and reach out to labor’s future,” he said. The genesis for the project came earlier this year, when Anderson, who is a member of the Guild’s Freelance Unit, began working with City College of San Francisco and San Francisco State University to set up journalism scholarships. The former labor and employment attorney asked Carl Hall, executive officer of the Guild, why the local wasn’t networking with journalism students at the two colleges and getting them into the Guild’s Freelance Unit. Anderson began talking to faculty, administrators and student leaders at City College and SF State, who were eager to help. Faculty encouraged students to participate. “The feedback we got from students was that they wanted publication opportunities and a chance to forge relationships with professionals, learning what it’s like in the work-a-day world,” Anderson said. The program began June 7 and students are required to meet Tuesday and Thursday evenings. On Tuesdays, a speaker series with media professionals is featured for two hours. Thursday nights are newsroom nights, complete with deadlines, expectations and editing. Rebecca Rosen Lum, chair of the Guild’s Freelance Unit, serves as the Editor-in-Chief for Bay News Rising. All of the students participating are members of the Freelance Unit and pay dues. Anderson, along with other union leaders, thinks the program could go a long way to encourage this next generation of young working journalists to see value in the labor movement. Anderson sees that the students are “pretty intrigued” about the union and what it does for workers. For Anderson, the best part of the project has been “making connections with these young people and having the opportunity to introduce them to the Pacific Media Workers Guild and unionism and activism in a way they never would have been exposed to in school,” she said. Jessica Schimm, one of the students participating in the program, said Bay News Rising feels like an extension of her regular journalism classes, but personalized. It has also helped Schimm tackle one of the most difficult elements of being a reporter – countering fears and stepping out of comfort zones to get a story. 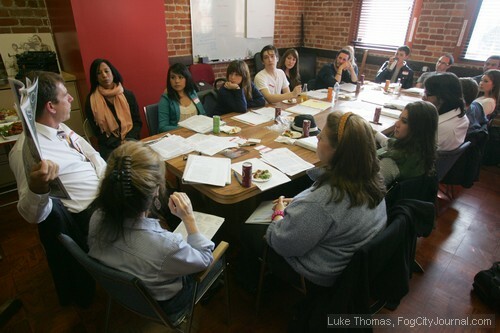 To read the students’ stories and learn more about the project, go to fogcityjournal.com and click on “Bay News Rising” in the upper left-hand corner of the page. Niesha Lofing, who is President of the Guild, can be reached at nlofing@mediaworkers.org. Kat Anderson can be reached at kanderson@mediaworkers.org.